Roy Moore suffered a narrow loss in a State where Trump swept to victory last year. DEMOCRAT DOUG JONES has scored a stunning upset victory in an intense US Senate race in conservative Alabama, dealing a humiliating blow to President Donald Trump whose chosen candidate failed to overcome damaging accusations of sexual misconduct. The Democratic win, a political earthquake in the most contentious US election of 2017 and in one of the reddest of Deep South US states, is a stinging blow to the president, who gave his full endorsement to Republican Roy Moore after initial hesitations, despite the serious allegations against him. With 100% of Alabama precincts reporting, Jones won 49.9% of the vote compared to Moore’s 48.4%, a margin of nearly 21,000 votes out of 1.3 million cast, according to figures posted by US media. Jones, 63, is a former federal prosecutor who shot to local prominence when he convicted members of the Ku Klux Klan who bombed a black church in the 1960s, killing four girls. The result puts an Alabama Democrat in the US Senate for the first time in a quarter of a century. “I am truly, truly overwhelmed,” Jones told ecstatic supporters at his election party in Birmingham, where aides and volunteers cheered and hugged. We have shown the country the way that we can be unified. Alabama, which Trump won last year by 28 points, has been at a “crossroads” before, and sometimes did not take the correct path forward, Jones said. Moore signalled he wanted a recount, but Alabama law provides for an automatic recount only if the margin is within half a percent. The current margin stands at 1.5%. Alabama officials will have between 26 December and 3 January to certify the vote. If no recount is ordered, Jones is expected to be seated in the US Senate in early January. 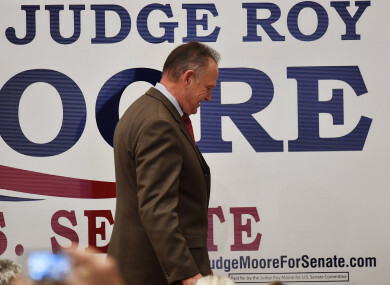 The loss by Moore, a former chief justice of the Alabama Supreme Court, shrinks the Republicans’ Senate majority to 51 in the 100-seat chamber, and reduces Trump’s margin for manoeuver to the bare minimum. By all accounts, it is a humiliating setback for Republicans as they struggle to move Trump’s legislative agenda through Congress and make the case that they are the responsible stewards in Washington heading into crucial 2018 mid-term elections. The Jones victory brought an avalanche of Democratic congratulations. “Tonight, Alabama voters elected a senator who’ll make them proud,” tweeted Hillary Clinton, Trump’s defeated presidential rival. The Democratic National Committee said Moore’s loss in the conservative heartland sends a “loud and clear” message to Trump and his Republicans. “You can’t call yourself the party of family values as long as you’re willing to accept vile men like Roy Moore as members,” DNC chairman Tom Perez said. Last night’s Democratic win is the second dramatic upset by the party in under two months. In November, in a sweeping rebuke to Trump, a Democrat won the governor’s race in swing state Virginia. But the tumultuous election was buffeted for the past month with the shock allegations by several women – first reported by The Washington Post one month ago – that Moore assaulted, molested or pursued several teenage girls, including sexually touching one who was 14 years old at the time. Moore had created a major headache for Republicans. The party’s leaders and members of Congress called on him to step down after the allegations first surfaced, to no avail. Email “Trump concedes defeat as Republican accused of molestation loses Senate vote”. Feedback on “Trump concedes defeat as Republican accused of molestation loses Senate vote”.